only a narrow fragment of the frame is visible, in standard profile combinations frame/casement 120mm. 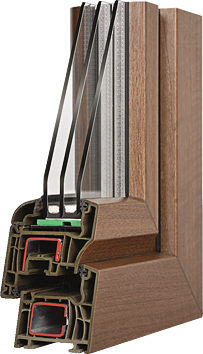 Depending on profile combination and the glazing type one can obtain a noise suppression coefficient Rw for the entire window at the level of over 40 dB. Please note! For a small additional charge, we have an offer worthy of recommendation to all troubled by noise – these are CAVA windows with the glass pane 6-12-3-12-4 – the different pane thicknesses increase the noise suppression coefficient from 31 to 35 dB! The aforementioned examples illustrate the following fact: the use of triple 0.5 glazing can reduce heat loss through windows by up to 65% as compared to standard 1.0 glazing! So it is possible to conclude that window panes, and not window frames, are the key factor affecting heat-saving parameters. It should be noted however, that the use of triple glazing requires rigid profiles, reinforced with steel minimum 2.0mm thick, as well as reinforced fittings capable of supporting heavier casements.